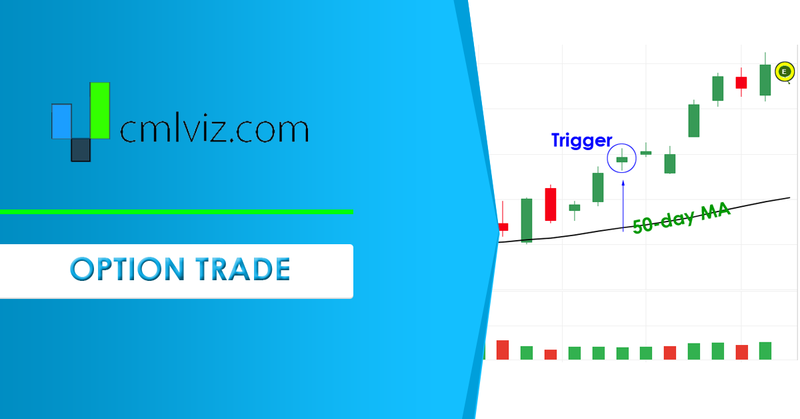 The results here are provided for general informational purposes from the CMLviz Trade Machine Stock Option Backtester as a convenience to the readers. The materials are not a substitute for obtaining professional advice from a qualified person, firm or corporation. There is a bullish momentum pattern in Expedia Group Inc (NASDAQ:EXPE) stock 3 trading days before earnings. Further, we use moving averages as a safety valve to try to avoid opening a bullish position while a stock is in a technical break down, like the fourth quarter of 2018. The logic behind the option trading backtest is easy to understand -- in a any market there can be a stock rise ahead of earnings on optimism, or upward momentum, that sets in just 3-trading days before an earnings date. That phenomenon has been well documented by Capital market Laboratories in our seminal webinar on market patterns. Now we can see it in Expedia Group Inc.
We will examine the outcome of getting long a weekly call option in Expedia Group Inc 3-days before earnings (using trading days) and selling the call before the earnings announcement if and only if the stock price is above the 50-day simple moving average. If the stock price fails the technical requirement, it's fine, we just put a pin in it and check next quarter. Notice that while this is a 2-year back-test and we would expect four times that many earnings triggers (4 earnings per year), the technical requirement using the 50-day moving average has avoided 1 pre-earnings attempts. In other words -- it's working. We see a 61.1% return, testing this over the last 7 earnings dates in Expedia Group Inc. That's a total of just 21 days (3-days for each earnings date, over 7 earnings dates). This has been the results of following the trend of bullish sentiment into earnings while avoiding the actual earnings result. We can also see that this strategy hasn't been a winner all the time, rather it has won 5 times and lost 2 times, for a 71% win-rate and again, that 61.1% return in less than six-full months of trading. ➡ The average percent return per trade was 12.6%. You can check to see if the 50-day MA for EXPE is above or below the current stock price by using the Pivot Points tab on www.CMLviz.com. We're now looking at 58% returns, on 2 winning trades and 1 losing trades. ➡ The average percent return over the last year per trade was 21.67%.